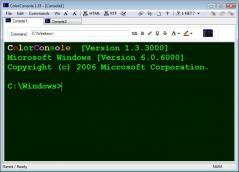 ColorConsole is a small piece of software that offers a colored alternative to the default Windows console and it includes shortcuts for frequently used commands such as network tools. The program is portable so you can launch ColorConsole by simply double-clicking the executable file. The UI resembles the classic Command Prompt. However, it displays the text and background in color and formatting options, as well as various menus, are available in the upper area of the window. Users are able to adjust the background color, as well as change the interface language and use the text emphasis mode. The text can be customized for printing, plus you can use the built-in search, and access favorite locations on your hard drive. ColorConsole also includes shortcuts to commonly used network commands like Traceroute and Ping, and you can add new ones from the Commands menu. The text can be printed or exported as an HTML or RTF file.